Utilising APIs to foster innovation and to create new business opportunities is not a new concept. A lot of success stories from eBay, Netflix, Expedia, mobile.de, and many others show the growing trend of API-driven business models. Most of the vendors for API management solutions are well-known players, such as IBM, Oracle, or MuleSoft, that try to provide a solution coupled to their existing ecosystem of enterprise products. One of the few exceptions is Kong Inc (formerly known as Mashape Inc), a San-Fransisco-based startup that became popular in the last two years by open-sourcing their core business product: Kong API gateway. In this article, I will briefly introduce the topic of API management and show how to bootstrap and use Kong API gateway. Why does API management matter? But utilising APIs is not easy and it comes with a price. The cost for the mentioned benefits is an increasing technical and organisational complexity. In this blog post we will explore ways to tackle the technical complexity and how Kong API gateway can help deal with it. Kong is an open source API gateway to manage RESTful APIs. It is part of Kong Enterprise, a bundle of Kong API gateway, a developer portal called Gelato and an analytics platform by the name of Galileo. It is aimed for enterprise customers that run thousands of APIs and require dedicated 24/7 support. For small to medium-sized companies, Kong API gateway (community edition) will suffice to make first steps in API management. Kong Architecture with five core components. 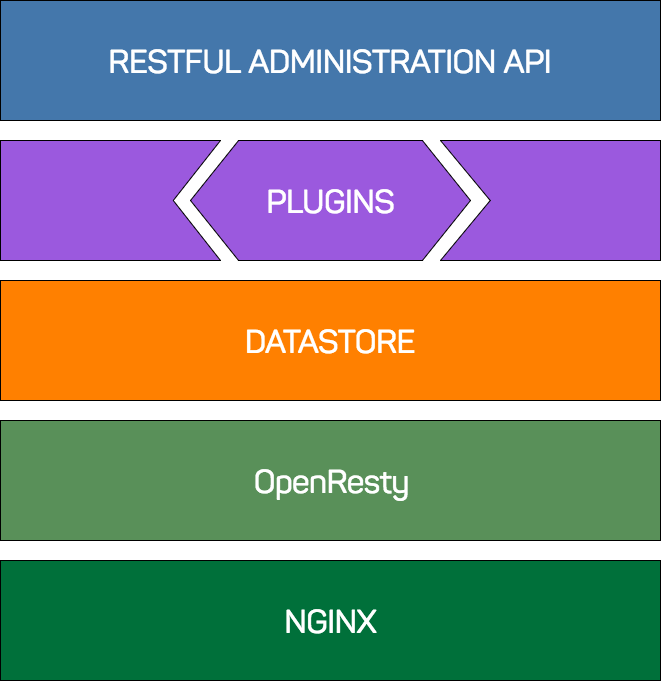 The five components of Kong architecture are: nginx, OpenResty, Datastore, plugins and a RESTful admin API. The core low-level component is nginx, a well-known and rocksolid web server. By 2017 35.5% of all known and 54.2% of top 100,000 websites worldwide use nginx. It can handle up to 10,000 simultaneous connections on one node with low memory footprint and is often used as a reverse proxy in microservice architectures, a load balancer, SSL termination proxy, or a static content web server. Apart from these use cases, nginx has many more features which deserve their own blog posts. 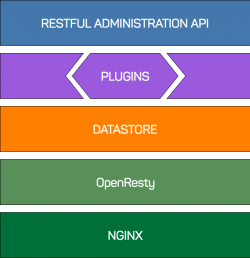 OpenResty is a web platform that glues nginx core, LuaJIT, Lua libraries and third-party nginx modules to provide a web server for scalable web applications and web services. It was originally built by taobao.com, the biggest online auction platform in Asia with 369 million active users (2017) and donated in 2011. After that, Cloudflare Inc. supported and developed the platform until 2016. Since then, the OpenResty Software Foundation has ensured the future development of the platform. The datastore component uses Apache Cassandra or PostgreSQL to handle the storage of the configuration data, consumers, and plugins of all APIs. The API configuration is also cached within nginx, so the database traffic should be low. 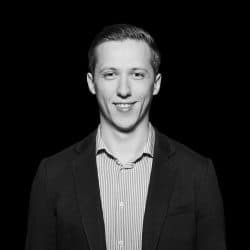 Plugins are Lua modules that are executed during a request/response lifecycle. They enrich the API gateway with functionalities for different use cases. For instance, if you want to secure your API, you would use a security plugin dedicated to providing only this functionality during the request. The Kong plugin system is open and you can write your own custom plugins. Finally, there is a RESTful admin API to manage the APIs. It may feel strange at the beginning to have no user interface. From a developer perspective, this is actually nice, because it provides a necessary tool to automate your workflows, for example with Postman, httpie or curl. Working with Kong for several months now, I have never felt the need to have a user interface because I could access all information in a fast and reliable way. But if you want to have a nice dashboard for your APIs you can use Konga or kong-dashboard, both free and open source community projects. Now let’s see how to manage APIs with Kong and which plugins provide basic security features. This part will be more technical than the previous. First, I will show you how to create a minimal infrastructure for Kong API gateway. Then I will add an API and a security plugin to restrict the access to a specific user. Now check the status by sending a GET request to the admin API. I use the tool HTTPie for this, but you can run curl command or use Postman as an alternative. In many cases you want to protect your API and give access only to dedicated users, so let’s see how Kong consumers and plugins work. Pass the apikey as a query parameter or as a header in your API call. The plugin also has configurations to hide the key after the request has been processed or to look it up in a list of keys. It is also possible to configure plugins on the consumer level, so each consumer will have their own settings. For example, you can create different rate limits for your consumers, so some of them can access your API more frequently than the others. In this blogpost I’ve introduced the topic of APIs and why it could matter for your business. Kong API gateway is a great open-source project that can help you manage APIs for free. With just few http requests, we have created and secured our first API. The RESTful admin API of Kong is clean and simple, which allows for fast integration into most continuous delivery pipelines. In the upcoming blog post I will show you how to build your own plugin and use the OpenID provider to manage API access.